Haydn Reeder was born in Melbourne in 1944 and graduated from the University of Melbourne. He undertook postgraduate studies in piano and composition at the Graz and Vienna Academies of Music. In 1991 he gained his Master of Arts at La Trobe University, Melbourne, for his compositions and a thesis. An APA Scholarship enabled him to gain his PhD from the University of Melbourne in 2005. His music has been influenced by his contact with musicians such as Alfred Brendel, Harrison Birtwistle, Pierre Boulez and Gyorgy Ligeti. His awards include one of two equal prizes in the 1976 Premio 'Città di Trieste' for his orchestral piece, Attract and Repulse, two Composer Fellowships from the Australia Council, and a similar Fellowship from the Victorian Ministry for the Arts in 1989. He has been commissioned by ensembles and soloists in London (the Australian Sinfonia, the Omega Guitar Quartet, the West Square Electronic Music Association) and Australia (Jochen Schubert, the Seymour Group, Flederman, Elision, the Melbourne Windpower, The Song Company). In addition, he has written a chamber opera and orchestral, live-electronic, vocal and choral works. Between 1983 and 1988 he lectured in theory and composition at La Trobe University. 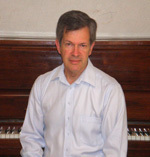 As a Research Fellow at the University of Melbourne, he edited and worked as copyist on several operas in the Australian Opera Project throughout the 1990s. In 1992, two of his works, Games of Balance for harp solo and Celebration of the Mandala for seven trombones, reached the final round in the Fukai International Harp Music Competition (Japan) and the International Trombone Association Contest (USA), respectively. His piano solo Masks has been recorded on the Move label, and, in 1996, Vienna Modern Masters issued a CD containing Lark 2 for saxophone and orchestra. In 2000, his ensemble work After the Cry was released on CD by the Melbourne Composers League who has also issued a double CD (2009) containing his Strong Song and Display for two pianos. Available also is his self-compiled CD entitled amBivALAeNCE, containing Molto espressivo for violin and piano, Chants at Play with Solid Background played by Het Trio, Glances, Repose for solo violin, Mandala Rite for clarinet and guitar and Interplay for guitar and electronics. Recent recordings are available, from the composer and the AMC, of live performances of Return to the Distilled Gold for 2 guitars and The Past is in the Present as we look to the Future for piano. Videos are now accesible on YouTube of several live performances presented mainly by the Melbourne Composers League, including Three Pieces for String Quartet,(Moving Between, Breathing and Drama), Bird and The Obstinate Flute. Besides composing, he continues to perform. In 2007 he formed a duo piano partnership with his brother Max: included in their repertoire are two of Reeder's duets, Duet 1 (Hidden melodies) and Duet 2. In addition he teaches piano, theory and composition, examines, and works as a music editor and copyist. Games of balance : harp solo Commissioned by Elision Ensemble. The City, the River, the Elm, the Stone : vocal sextet (1993) Commissioned by The Song Company. Chants at play, with solid background (trios: flute, bass clarinet, piano) (1990) One of the works written as fulfillment of a Composer Fellowship awarded by the Victorian Government. Clashing auras : for wind octet (1989) Commissioned by Melbourne Windpower. Temi distrati : chamber ensemble (1984) Commissioned by Flederman. Penumbra : chamber ensemble (1984) Commissioned by Seymour Group. - Program note: Haydn Reeder's "Return to the Distilled Gold"